I hate buying breakfast cereal. It comes in a plastic bag inside of a cardboard box, that’s a lot of waste. And you pay top dollar for organic options, which is what I like to eat. So I make granola…like, a lot of granola. Sometimes I get busy and we run out. This happened a week or two ago and I’m finally getting around to making another batch. The Self Reliance Challenge is being a very good influence on me! I’ve made quite a few different flavors of granola, including chocolate and peanut butter. I will have to record the recipe sometime to share. Usually I just dump and stir until it tastes good. Make sure you add the raisins after you bake your cereal or they will burn. The same thing goes for any dried fruits. You could substitute dried apple dices, or any other dried fruit…do your own thing! Measure oats, nuts, and cinnamon into large bowl and combine. Pour hot water and honey into small mixing bowl and stir well. Add vegetable oil, stir, and pour over oat mixture. Stir until oat mixture is coated with honey mixture. Spread in two 9 x 13" baking dishes and place in 300F oven. Stir every 10-15 minutes. 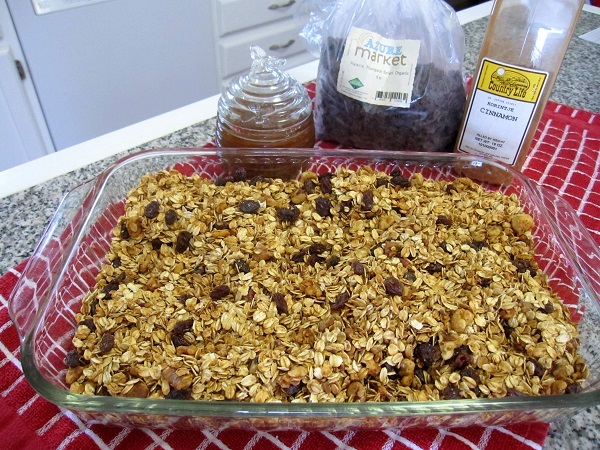 Bake until granola has dried out and is slightly crispy, about 45 minutes to an hour. Cool to room temperature on a wire rack, add raisins, combine, and place in an airtight container for storage. I order a lot of my ingredients in bulk from buying clubs. You can read more about ordering from buying clubs in my post How to Start a Buying Club. But you can also get these ingredients from other stores. You might like to change up the ingredients in your homemade granola. Try adding sunflower seeds, shredded coconut, pumpkin seeds, different spices, cocoa powder, or switch out the honey for agave nectar or whatever you fancy. Organic raisins are available through Azure Standard.